Download Hungry Caterpillar Play School Now! Your little caterpillar deserves every chance to succeed. 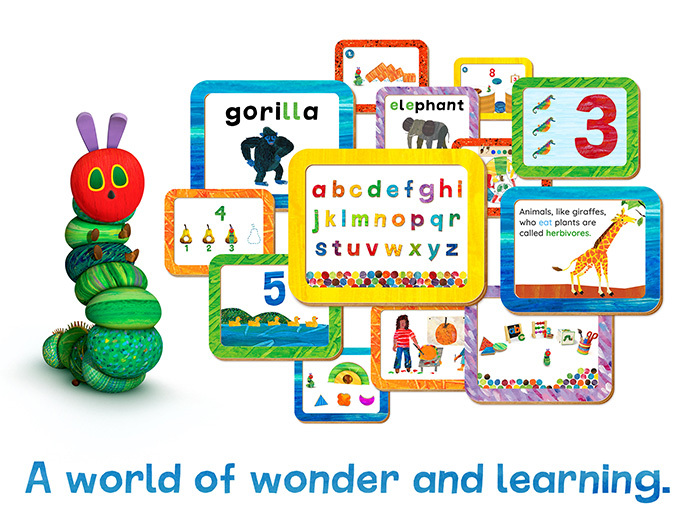 Eric Carle’s Hungry Caterpillar Play School is specifically designed to give young children every advantage they need in math, spelling, reading, writing, science, nature studies & creative arts. Help your child get ahead and school-ready with internationally recognized early learning goals! Play is kid’s favorite way of learning. In fact, playtime is when everyone’s brain is at its most receptive. So we’ve made sure your child’s experience is filled with wonder and humor, as well as leveraging the most up to date best practices in children’s education. **This app is optimized for iPad 4 and above, iPhone 5S and above, iPad Mini 2 and above. • SHAPES AND COLORS empowers kids to develop reasoning skills in a series of 3D playgrounds. 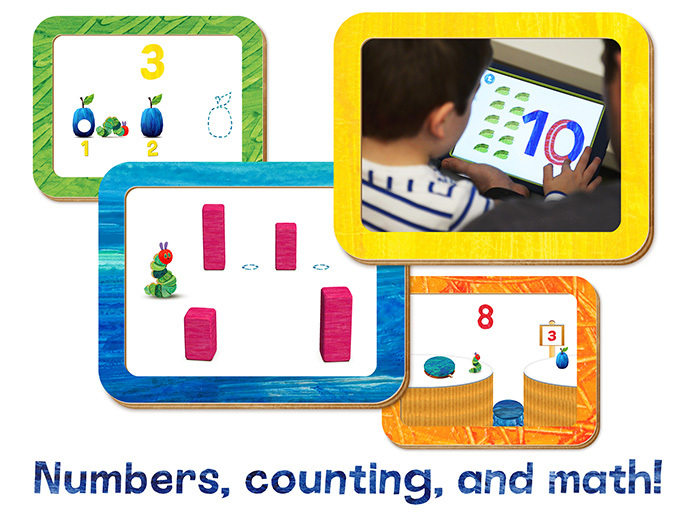 Help prepare children for understanding math, art, reading & writing. • ABC SECTION establishes the building blocks for reading success. 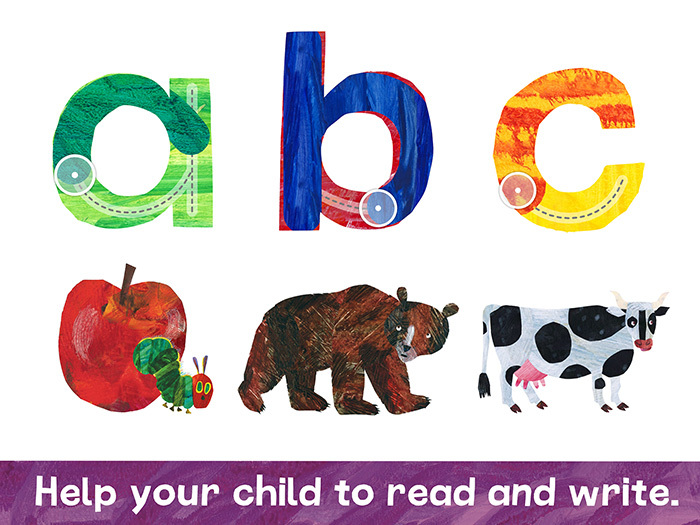 Learn about the letters of the alphabet and how they join together to make words. 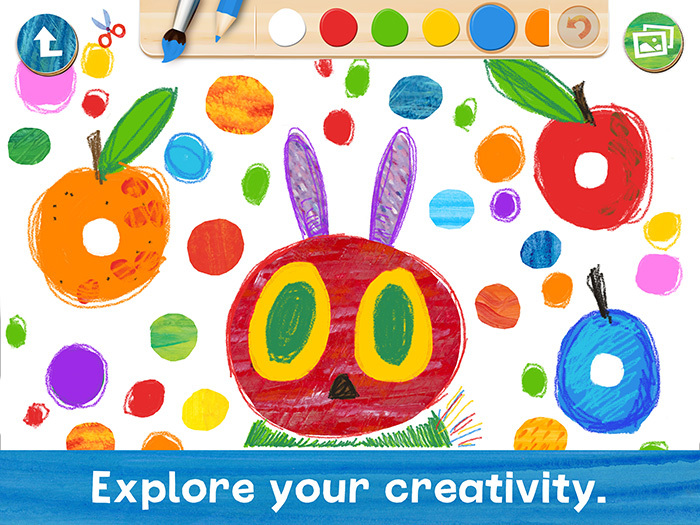 Discover a world full of interactive Eric Carle characters along the way. • 123 SECTION guides kids through every concept they need to learn to set them up for math proficiency. Young minds learn by figuring out puzzles and repeating activities over and over again. Repetition is key, so we’ve specifically designed this section to be different every time they play. • ART SECTION is especially inspired by Eric Carle’s iconic artwork. Expand your child’s imagination and encourage artistic expression. Budding artists can draw, paint, color, design and create in unique ways: Paint or cut out collages. As little fingers play and explore they’ll discover all sorts of fun features. • One of the best ways to encourage your child to read, is to read to them. LEARN ABOUT THE WORLD BOOKS are engaging non-fiction titles specifically tailored for young children. 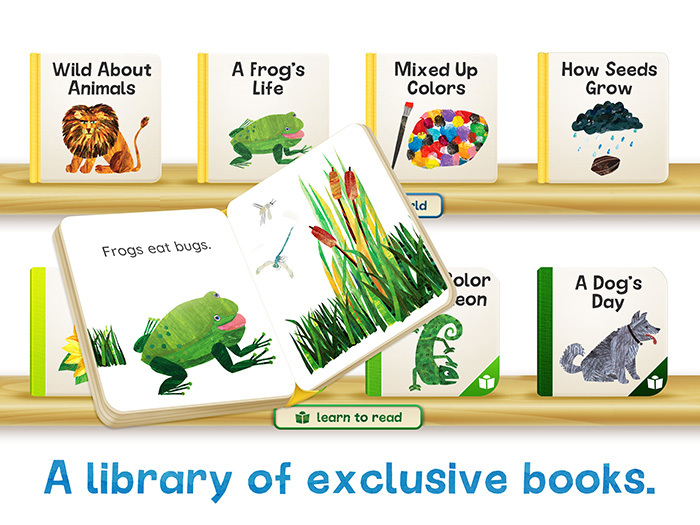 These books are read aloud to your child and feature themes of nature, science and art. • LEARN TO READ BOOKS are a tailored reading experience which guide children through multiple early reading levels. These titles are designed for independent reading but if your readers encounter a word they don’t know, they can tap on that word and it will be read aloud. These interactive books encourage kids to learn at their own pace. • Activities and subjects are supported and enhanced by SONGS & VIDEOS to deepen your child’s learning. Songs are a tool used by teachers all over the world and a proven way to help anyone learn and remember. Feed your hungry little caterpillars brains. Marvel as they grow, and take off — just like a butterfly. Here at Storytoys we’ve been gearing up for a very important birthday. The Very Hungry Caterpillar turns 50 in March, so we’ve been hatching something wonderful.This month we’ve got a new LEARN TO READ book for you. It’s called MORE THAN ONE. Discover when we make regular nouns plural, we usually add s to the end of a word. Introducing Hungry Caterpillar For Schools – this version of Hungry Caterpillar Play School is specifically designed for teachers and schools. Pay once and still get all of the regular updates for the subscription version of Hungry Caterpillar Play School. Hungry Caterpillar For Schools is a fun and playful app designed to help young children master key early learning goals, as defined in the Head Start Early Learning Outcomes Framework.